Black leopards have the perfect camouflage for the night, a rich black coat that hides them from their prey. It also hides them very well from human eyes. 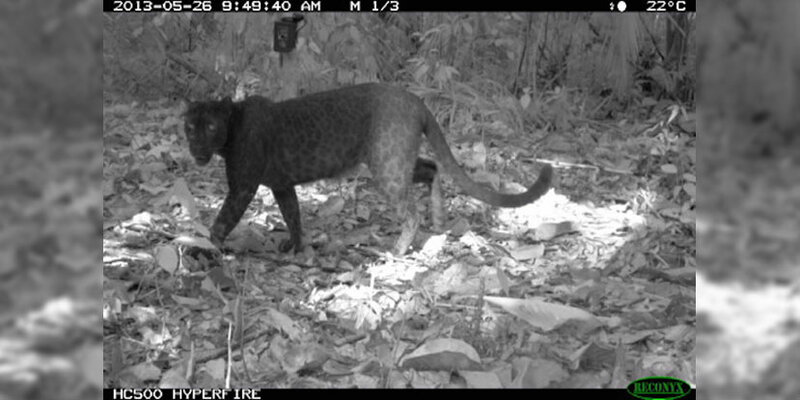 Now researchers studying black leopards in the Malaysian Peninsula have discovered that using an infrared camera at the right wavelength shows that these leopards actually have spots. Just like their lighter leopard cousins, these cats have a beautifully made pattern hiding under that black camouflage. The researchers from University of Nottingham and James Cook University are using this method to calculate and identify the population of black leopards since every leopard has a different pattern like a fingerprint on humans. The black leopard is a magnificent animal and keeping their population strong is important for everyone. Finding a way to identify and track them is huge. It will help researchers do a better job and have accurate data from this point forward and that’s a good thing. We’re looking forward to more awesome pictures like the one above. Now I wonder if snow leopards have spots? What do you think about black leopards having spots? Let us know in the comments below or on Google+, Facebook and Twitter.